The latest Netflix Original true crime docuseries is Evil Genius, which deals with the infamous and bizarre “Pizza Bomber” bank heist case. Back in the ’80s, Marjorie “Marge” Diehl-Armstrong seemed to have it all. She was the beautiful only child of a well-to-do family and a real “man-magnet.” After earning college and graduate degrees, Marge gradually descended into madness, leaving behind a trail of dead men: one husband and four boyfriends. Diehl-Arnstrong also masterminded one of the most heinous bank robberies in American history that was precedent-setting in its use of an explosive device that actually went off during the commission of the crime. This Netflix Original four episode mini-series kicks off in Erie, Pennsylvania on August 28, 2003. Brian Wells, a pizza deliveryman walks into a PNC bank with a cane shotgun and an explosive device locked around his neck. He hands a lengthy holdup note to the bank teller, and then leaves with a sack containing nearly $9000. Wells is immediately arrested and tells the police that he was forced to rob the bank to avoid being killed by the explosive collar. The bomb squad is called but arrives after the collar has detonated, killing the pizza guy. Evil Genius would not have piqued the interest of the Duplass Brothers Production Company had the story ended right there which, of course, it does not. The FBI take over the case and, assisted by the Pennsylvania State Police and the ATF, they discover that the bomb-collared Wells had gone on a “scavenger hunt” to find the instructions that led to his final destination. The plot thickens as one of Wells’s co-workers, Robert Pinetti, dies under mysterious circumstances before the police can question him. Bill Rothstein had been romantically obsessed with Marjorie for many years. He calls the Pennsylvania State Police and tells them to arrest her for killing her boyfriend James Roden, three weeks before the bank job. Rothstein eventually leads them to a freezer in his garage where the cold corpse has been stored. Floyd Stockton, Rothstein’s former roommate, becomes another person of interest but not before Marjorie is arrested for Roden’s murder and gets incarcerated in the Muncie, Indiana State Penitentiary. In 2005, producer/director Trey Borzillieri begins corresponding with inmate Diehl-Armstrong who, quite surprisingly, begins to divulge “secrets” about the Pizza Bomber case that stir the pot even further. The FBI’s interrogation of Marge’s fishing buddy and drug dealer Ken Barnes finally connects many but not all the dots in this bizarre, convoluted mystery. Following in the footsteps of Netflix Originals like The Investigator: A British Crime Story and Mindhunter, Evil Genius delivers a masterful blend of film footage from crime scenes, police interrogations, and interviews with FBI agents, police officers, and acquaintances of Marjorie Diehl-Armstrong. Writer/director Barbara Schroeder and Trey Borzillieri paint a grim portrait of a ruthless, manipulative killer who ultimately comes across as evil incarnate. Questions might remain about whether Brian Wells was really a victim or a just another co-conspirator. That aside, Evil Genius is still a highly compelling mini-series that exposes the tenacity of law enforcement officers who pursue and eventually solve a cold case. 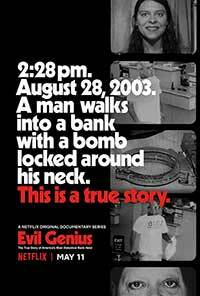 Netflix's Evil Genius is a noir docuseries that sheds light on a bizarre bank robbery gone bad and exposes its ultimate evil mastermind.